Come on out, Lucky - it's great out here! ...and refused to move from the spot he settled. But Mr. K took him under his wing and taught him to put one paw in front of the other. 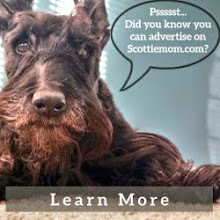 I'm a Scottie Mom - obviously - but I'm learning what it is like to be a (temporary) Shih Tzu Mom. Lucky is nothing like Heather or Mr. K but believe it or not, he does express a bit of Scottie-tude when he doesn't get attention. He enjoys cuddles, stalking humans and begging for scraps...typical dog stuff, right? Contrary to most dogs, however, Lucky can't stand squeaky toys. In fact, I haven't seen him pick up a single toy during his stay. I suppose he is too mature for something like that! Lucky prefers to be in the company of belly-rubbing humans like Scottie Dad 24/7 and falls asleep within minutes of snuggling up - even with someone he just met. So when those belly-rubbing humans walk out of his range of accessibility, that poses a real problem. Yesterday, we ventured out on the deck with Heather and Mr. K just before the sun started setting. 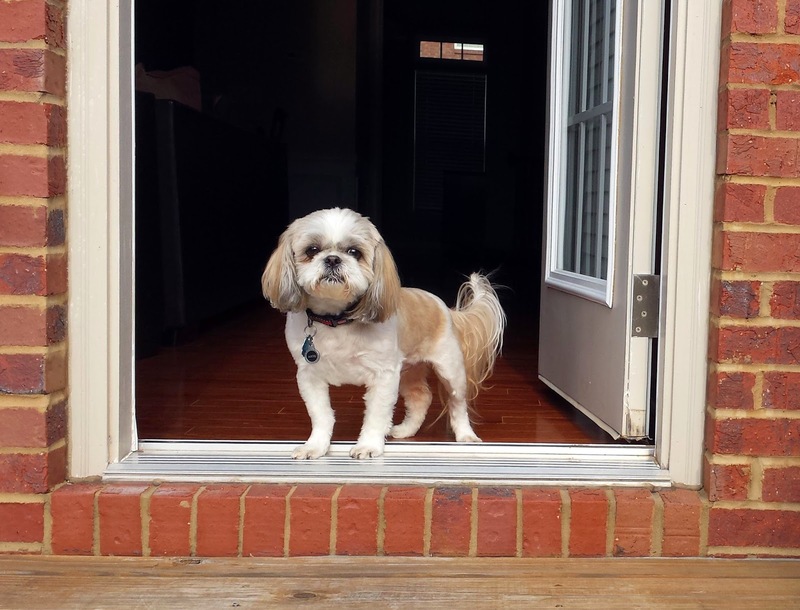 Lucky stopped short at the door. 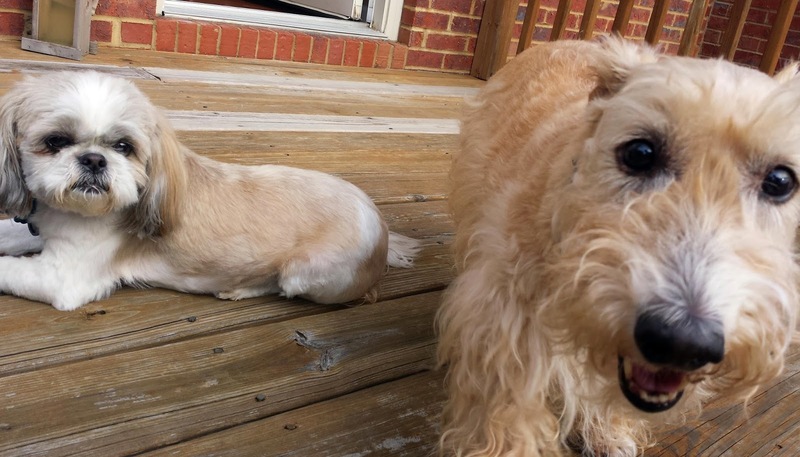 Scottie Dad called out to his little buddy but Lucky remained firm, not lifting a paw. 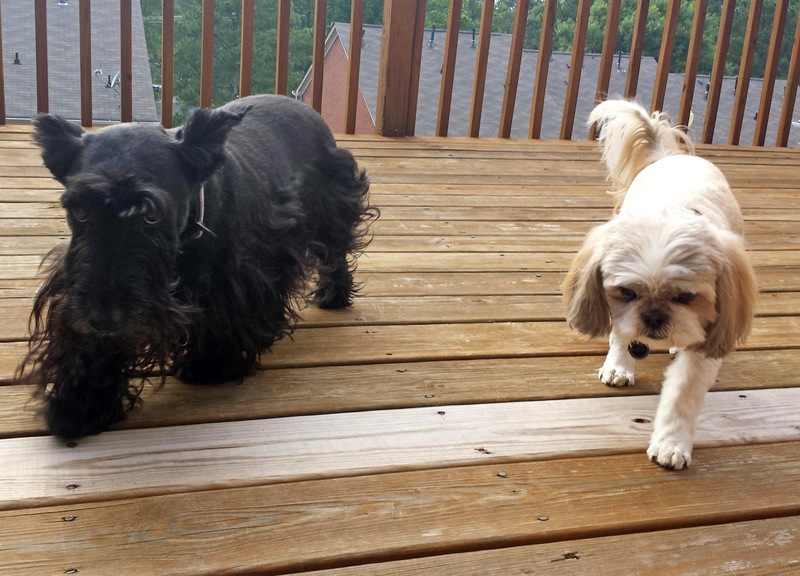 Even though we were within his range of sight, Lucky refused to step onto the big, scary deck and let out a cry. It took some coaxing, but Scottie Dad was able to convince Lucky after a good 12 minutes to take a little board walk. Lucky obliged but sat his bottom down after only two or three steps and would not budge. His eyes were wide and he peered around him cautiously. This was a new experience for him and clearly, not one he was enjoying. He looked between the cracks of the boards and promptly sat up - visibly freaked out that the ground appeared so far below. Is it possible dogs can be afraid of heights? Scottie Dad scooped Lucky up and we all hung out for a bit before turning in for the evening. 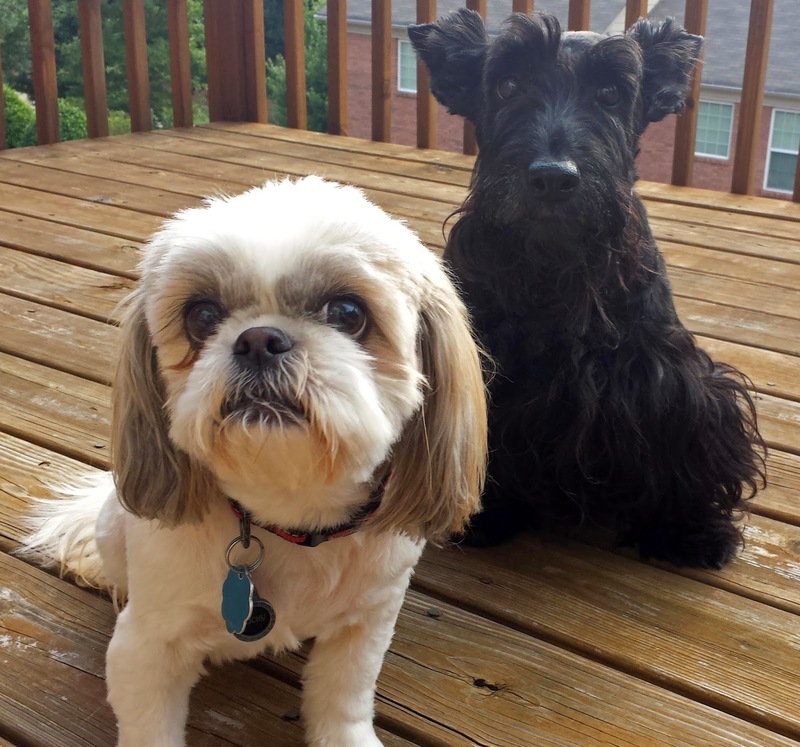 We hoped Lucky would dare to make the "long" trek back into the Scottie House on his own. Scottie Dad placed Lucky back on the deck floor. Immediately, Lucky sat down. Scottie Dad and I walked just inside the door and started calling words of encouragement to Lucky. He didn't budge. Heather and Mr. K were still hanging out on the deck but Mr. K went over to his nervous buddy and showed him there was nothing to worry about when taking a little board walk. 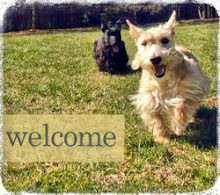 He paced around until Lucky lifted his bottom and walked side-by-side with him into the Scottie House. Doubtful Lucky would be itching to go out again soon, we celebrated his little achievement with a special treat. What are some of the quirks your dog has and how have you worked to overcome them? Sidney is terrified by stairs. My daughter lives in a building that has stairs and an elevator. He is also terrified by the elevator. Shelby goes with the flow.